German vehicle modification specialist Bösenberg creates mobile command vehicles that are equipped in a way that perfectly matches their specialised use and ensures absolute user-friendliness during operation. With its newest concept, Bösenberg raised the bar even higher. The new VW Crafter Mobile Command Unit makes the most of the capacities of the new Volkswagen Crafter by connecting Mastervolt’s electrical power system with the vehicle’s own CANbus. Combined information from both sources is visible on the dashboard screen. 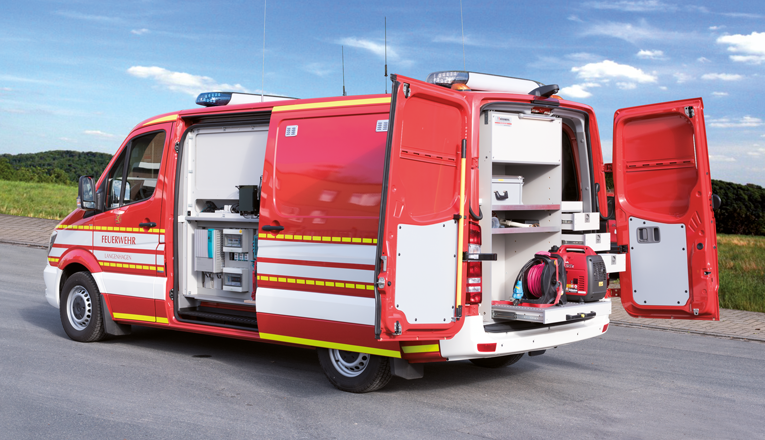 Responding to a request by Volkswagen Commercial Vehicles, Bösenberg and Mastervolt joined forces to develop a firefighting command vehicle based on the new Volkswagen Crafter. The interior was designed and built by Bösenberg and equipped with a dedicated Mastervolt electrical system, with our Lithium Ion Ultra battery powering all the mission-critical AC and DC equipment on board. Apart from the custom interior, Mastervolt and Bösenberg were asked to make use of one of the new Crafter’s most interesting features – the ability to have the electrical and other systems monitored and controlled from the vehicle’s dashboard and/or via a smartphone app. To facilitate this, the two companies designed the first ever integration of a Mastervolt electrical system with a vehicle’s own CANbus system. The resulting system sets a new standard in its class in terms of interior layout, in-vehicle automation and ease of use. For Mastervolt, this development is a crucial step in our mission to be the market leader in autonomous power systems that offer unprecedented ease of use. With electrification and smart connectivity being two of the main trends in the professional automotive market, this extraordinary partnership with Bösenberg and Volkswagen Commercial Vehicles sets the tone for other upcoming innovations. Absolutely fail-safe components and straightforward communication in all circumstances. 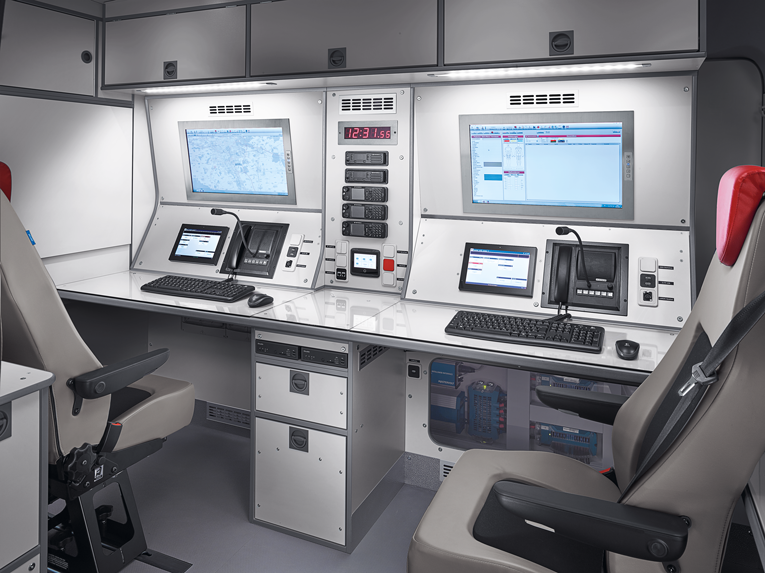 Operation and monitoring of the electrical system via dashboard touchscreen and/or smartphone app. Full integration of the vehicle’s own CANbus system with Mastervolt’s electrical system. Connection to the new Volkswagen Crafter’s customer-specific function module for the control and monitoring of components such as lighting via the vehicle’s navigation display. The system was designed to enable life-saving missions without the engine running and without 230 V grid connection. The use of MLI Ultra 12/2500 Lithium Ion technology ensures the longest possible autonomy for the mobile command vehicle within the existing weight restrictions. This allows the command vehicle to fulfil its lifesaving missions without keeping the engine running on location. The combined inverter/charger allows the vehicle’s batteries to be charged with a plug-in connection on site, or the system to run on AC power during a mission. At the same time it ensures that firefighters always have a live AC socket available inside the vehicle, even when running fully on batteries. Everything is optimised to be as lightweight as possible. In addition to the full system information being available on the vehicle’s dashboard screen and on the commander’s smartphone, an EasyView 5 display has been installed in the back of the vehicle where the command station workplaces are placed. This ensures that all the relevant data is always within reach there too. Mastervolt’s internet-based Amperian platform is a powerful digital assistant that keeps an eye on your Mastervolt power system. Mastervolt recently designed a new interface to access the benefits of Amperian which connects to the internet using a secure Ethernet or WiFi connection. 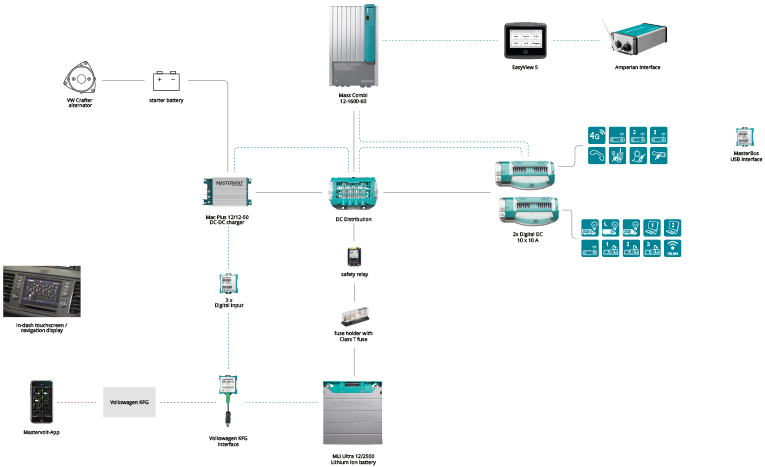 The Amperian Interface can reach every individual MasterBus device within a system, enabling continuous remote access. Moreover, Amperian can be set to alert users automatically in case of any issues. This DC-DC charger is Mastervolt’s latest innovation, and is the Euro 5/6-compliant solution for proper charging of the Mastervolt Lithium Ion battery which powers the command station. The Volkswagen Crafter carries a smart alternator to comply with the latest Euro 6 emission standards, and this makes it challenging to get a secondary battery fully charged while driving in case of a traditional system. Our DC-DC charger solution brings an end to this problem.